Today I want to show you one powerful technique that usually results in higher rankings across multiple keywords. I’m not just going to tell you what this technique is, I’m also going to explain to you WHY it can be so effective and then tell you how you can carry out this strategy immediately for your own websites and pages. The strategy that I am referring to is called “Backlink Boosting”. This is where you build other backlinks to your existing backlinks in order to SURGE activity and breath a new lease of life into your links and sites. It has worked for a VERY long time and continues to work very well to this day. What Does Backlink Boosting Actually Do? First it creates activity to your existing backlinks. It tells Google that other pages and sites are “talking” about and linking to pages on the web that ALSO link to YOUR website. When this happens with dozens or even hundreds of your backlinks the collective effect it has from EACH one creates an organic surge which helps to push your sites up the rankings. It creates a similar effect that trending / viral news can have on specific sites that are directly linked to those trending stories. Secondly, it’s a fact that up to 80% of a websites backlinks are not even indexed in Google. If a backlink is not indexed in Google then it yields no “ranking” power. By building links to your existing links you will get MORE of your existing links crawled and indexed. The result… higher rankings! Thirdly, it creates 2nd tier backlinks for you. When a REAL organic backlink is created it is placed on a high value page with the intention of sending real people to another valuable source. Naturally, some of those people will post about that page and link back to it themselves. By boosting your links you are creating these 2nd tier links and signals which makes them appear more organic. I’m sure it is not the first time that you have heard about the effectiveness of 2nd tier backlinks. They work well and help you to create a natural “SEO” link profile. A couple of days ago I emailed my customers and subscribers to tell them about a new link boosting software tool that has just been released called “Link Alchemist”. Did you see that email? 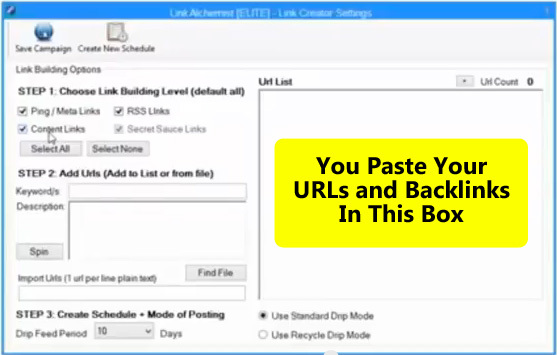 Link Alchemist allows you to build lots of links to not only your money sites but also to ALL the pages that contain your existing backlinks. It performs this task in a random order and uses drip feed technology. The BETA testers who carried out testing for this software have all seen an increase in rankings. How Does Link Alchemist Work? You simply paste in ALL the URLs that you want to build backlinks to, add your niche anchor text keywords and spin-able description, set your schedule and click SUBMIT! The best part about this software is you do NOT have to spend time creating accounts. When you grab a copy of Link Alchemist you get instant access to 15,000+ accounts across multiple platforms and sites. This means you will be up and running within about 5 minutes of loading the software. There are THREE options to choose from so take a look at these options and grab the one which is most suitable for your needs. Just to add some additional value for you I have bundled in a number of bonus software tools, reports, graphics etc for you. Link Alchemist is a great tool when it comes to boosting your backlinks, increasing your rankings (or your clients) and doing this within just a FEW minutes. However, it won’t be available at this launch discount for long so be sure to check it out ASAP. You always hhave good advise and tools.Keep up the good work!